I never shy away from a good bet, especially when I have a hand in determining the outcome. 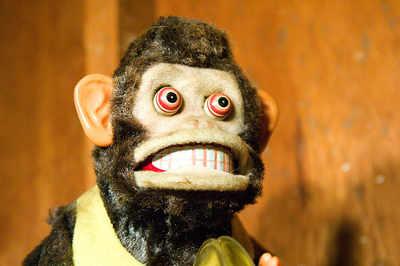 But when I realized the cost for our store redesign would be $50,000, it gave me serious pause. Was I making a smart long-term investment? Or just the worst – and biggest – bet of my life? In this post I’ll be explaining why we’re embarking on such a massive project, how we prepared for the redesign and the analysis I did to make sure I wasn’t certifiably insane for spending so much. As I’ve written about in the past, I’ve made some terrible decisions when it came to investing money into high-end eCommerce design. Specifically, I spent $5,000 on a professional design when launching TrollingMotors.net only to have to tear it all down and replace it with a basic, free stock theme. So why in the world would I want to risk making the mistake a second time at 10x the cost? There are two big differences this time around: the business’ age and the reason for the new eCommerce website design. We’ve been selling radio equipment at Right Channel Radios for nearly 7 years and really understand the market, our customers and their needs. Additionally, it’s a business that’s established enough to justify investing in. With the TrollingMotors.net design, I invested heavily in a redesign for a new business I knew nothing about and that hadn’t generated a single dollar of revenue. Secondly, this redesign focuses heavily on functionality and usability enhancements. We’re not merely doing this to build a “prettier” site. Instead, there are many critical usability problems we want to address as we’ll get into below. The last time we redesigned Right Channel Radios was in 2012, and it went well – we saw revenues increase approximately 50% right after the redesign. But it’s been almost three years and after a strong 2012, we’ve seen the site become gradually less effective each year. In fact, revenues were down in 2014 by almost 30% from the previous year – the first time ever we’ve seen a year-over-year decline. And a pretty sizable one, at that. One of the biggest culprits? Mobile shoppers. Since our last redesign in 2012, mobile and tablet traffic has exploded by 180% and 166% (respectively) while desktop traffic has fallen by more than 30%. Even more importantly, revenue from mobile grew at over 200% while revenue from desktop visitors was almost cut in half. That’d be great news if we had a killer mobile website, but we don’t. It’s downright awful. People were buying despite our website, not because of it. And our overall revenue and conversion rates showed that to be the case. So implementing a new top-shelf mobile eCommerce site was a large part of the redesign decision. As we’ll get into later, we opted to go with a responsive site vs. a standalone mobile site. With a responsive site, we only have to worry about maintaining one code base vs. trying to manage a separate mobile dedicated site. While convenient, responsive sites do have their drawbacks – notably that they can be significantly slower than sites optimized exclusively for mobile phones. However, we’re hoping to mitigate many of these problems by doing some programming magic to keep load times manageable. More on this in the future. I’ve made no secret about this the last year: eCommerce is getting more competitive and if you’re not working hard to build a unique brand, you’ll likely be out of business in 5 years. This is especially true if you sell other people’s products, like we do at Right Channel Radios. Without offering any truly unique products, why should people buy from us over Amazon? We’re using the redesign to specifically improve three areas of our brand: our design, our focus and our personality. I’m a big fan of starting lean and keeping design minimalistic in the early days of a business. Again, I’ve learned the hard way not to invest heavily in design in the early days of a business. But once you have an established business, a professional design can deliver an instant shot of credibility and trust to your visitors. As eCommerce is getting more competitive and mature, this is becoming increasingly important. Since 2012, our site has looked increasingly outdated every year. Our current design was implemented by yours truly back in 2012, and even then it wasn’t going to win any awards. Apart from the antiquated look and feel, there were a number of elements of our current design that didn’t facilitate a smooth shopping experience. From how customers browsed category pages to how they moved through the checkout process, we studied each aspect of the shopping process and found numerous friction points. With the redesign, we’re hoping to fix these so that the site actually works better in addition to looking more professional. I’ve never regretted “niching down” a store to focus on a specific type of customer. 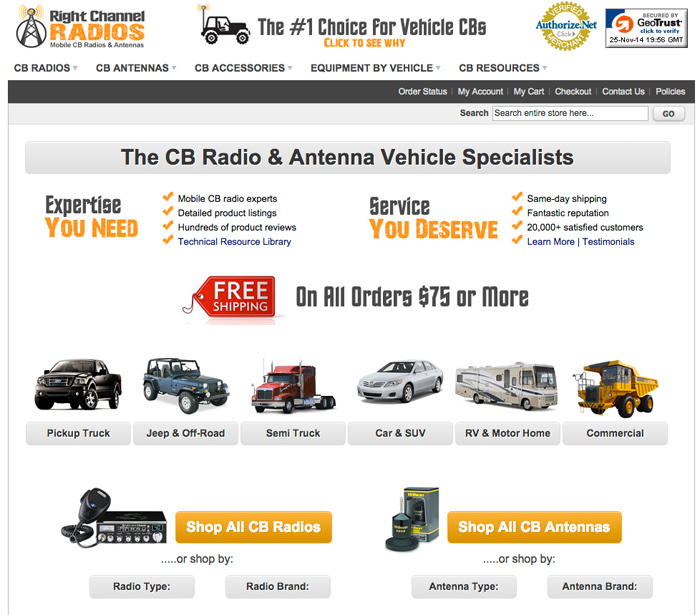 In our last design iteration, we changed our focus from selling radios to selling radios specifically for vehicles. And with this redesign, we’ll be doing that again. Over the last few years, we’ve come to realize we specifically love – and can best help – customers who own 4×4 vehicles or pickup trucks. That’s where we really can add the most value, and we’ll be re-positioning the site accordingly. To build a strong brand and stand out, I wanted to infuse personality into our new site. Specifically, I wanted to overhaul our boring, straightforward product descriptions and email notifications with fun, compelling and humorous product copy people would really enjoy reading. Copywriting ninja Laura Serino recently came aboard the eCommerceFuel team, which gave me a perfect excuse to do this. Since 2012, we’ve run Right Channel on Magento. Originally, I liked the fact that Magento was open source and self-hosted as this gave us complete control over our site. Anything I could dream up, we could (in theory) implement. But in practice, Magneto ended up being a royal pain. Without a regular system admin on the team, I had to learn UNIX and figure out how to run a server. Troubleshooting issues would often take hours if not days. The upgrade process was so fraught with land mines we never embarked upon it, so our site couldn’t take advantage of the latest and greatest features. And when I did hire a programmer, I had to worry about them messing things up as well and taking our store offline. For a store our size, I ultimately decided that moving to a hosted cart was a much better decision. We may not be able to tweak every line of code, but we’d be able to do 95% of what we wanted to without having to worry about server issues, backups, upgrades or tech headaches. Disclosure: After making the decision to migrate to Shopify, I pitched them on sponsoring the podcast which they’ve done since the beginning of November. 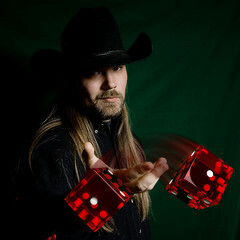 I’ve also worked with them on numerous projects in the past. There are a lot of choices in the world of hosted shopping cart software, but for me it came down to Shopify vs. Bigcommerce. Ultimately I chose Shopify. My decision primarily came down to two main factors: system architecture & ecosystem. In talks with numerous developers, I heard repeatedly that Shopify had an incredibly robust and customizable templating framework that would let you do just about anything. As we had plans to customize the new site heavily, this was really important to us. Secondly, Shopify has the largest ecosystem in the hosted cart world. While this is important from an app selection perspective, it also was enormously important from the perspective of finding developer talent. In my personal network, I can think of a least half a dozen solid Shopify developers. But I know just 1-2 who specialized and know Bigcommerce well. I’m really excited to be making the switch to Shopify, and can’t wait to have our business on a platform that’s easy to manage and maintain. Update: We have migrated from Magento to Shopify and sales have increased sales by 41%. You can find the full case study here. My method for picking a design firm was probably the least scientific aspect of this entire process, but it’s worked out well. I ended up hiring Carson McComas from ShopifyCustom.com to spearhead the redesign. Carson wasn’t the finalist in a fight-to-the-death gladiator match of half a dozen eCommerce website design companies. Instead, he was someone who had an impressive portfolio and that I slowly built up a good rapport with over time. If you have the luxury of knowing you’ll be embarking on a redesign in the next 6 to 12 months, start connecting with potential design candidates now. It will be much easier to make a decision if you have a long track record and multiple interactions to look back on vs. a rushed interview process with numerous designers. If you’ve never quoted high-end design and programming work before, the $30,000 design/programming price tag may shock you. Sadly, great programmers and designers aren’t cheap. If you’re looking for someone who is smart, responsive and really knows their stuff (like Carson), you’re going to have to pay up. So we did. We’re almost two months into the project, and it’s amazing to see how much goes into thinking through, planning and executing on a high-end design. It’s a phenomenal amount of work. I’m not sure I could ever call $30,000 cheap, but I can definitively say we’re getting great value for our money. Perhaps the greatest test? I’m not sure I’d take on the project for someone else for $30,000 if the roles were reversed. The other $20,000 of the $50,000 budget I alluded to is coming from the involvement myself and my team will have over the 4-5 month course of the project. Despite having Carson’s team doing the heavy lifting with design, I’ll be spending the majority of my work days on the project until it launches. The rest of our four person team is also primarily focused on the relaunch: Laura is writing tantalizing new copy, Pat is taking a ton of new images and our VA team members are working on a number of data heavy tasks. So between my time and the payroll expense allocated to the project we’ll definitely hit the $20,000 mark. While all of these issues are compelling reasons to consider a change, it’s still not enough to justify a massive $50,000 investment. For that amount, you could buy an Aston Martin, a home in Puerto Vallarta or 100,000 apple pies at McDonalds! Am I insane? And how do I know this investment is reasonable and/or will pay off? To be honest, I don’t. And it’s a bit terrifying considering it. But there is a process to make sure you’re taking a reasonable investment risk vs. simply throwing money into the wind. It’s a process I like to call the “Am I Bat Crazy?” ROI Test. The goal is to use some reasonable assumptions and see what the potential payoff for our redesign investment will be. Note: These aren’t real net income figures for Right Channel, but using actual numbers will make this analysis easier to understand. For the sake of illustration, let’s say that Right Channel nets $100,000 in profits per year. Normally, a growing and healthy eCommerce business would be able to sell for 2.5x to 3.0x net income. But because sales have actually declined this year, the multiple we’d likely see would be much closer to 2.0x. Let’s also assume that over the course of the next year, we’ll see a decline in net income/revenues similar to that we’ve actually experienced over the last year at around 30%. That’d mean one year in the future, the business would have made $70,000 instead of $100,000. Assuming we do nothing, in this hypothetical scenario we’d likely receive $270,000 in value from net income + the value of the business (if we wanted to sell it) over the next year. Now that we have a baseline, let’s pencil out some rough numbers for a redesign scenario. Let’s make the assumption that the redesign will results in a 50% increase in revenues/profits. This may seem high to many, but I think it’s a realistic projection. In the past, this is the minimum increase I’ve seen in both the redesigns I’ve personally done for established businesses. Both of those were done without the help of a highly trained design firm. And neither of them faced some of the UX (mobile) and design issues currently plaguing our site. There’s a chance conversions will increase by less than that (or, heaven forbid, actually decrease), but I think it’s a reasonable assumption to use for the analysis. A 50% increase in net profits would mean $150,000 in hypothetical net income for the business in the coming year. Would you risk $50,000 if you thought you had a better-than-not chance of earning an additional $292,500 within a year? Of course you would! It’s nearly a 6x return on your investment in 12 months. Not too shabby. Again, these net income numbers aren’t the actual ones for my store. But this is the exact process I went through using real figures when deciding whether or not to move forward. One of the biggest mistakes you can make is thinking that hiring a talented design firm will ensure a successful outcome. Nothing could be farther from the truth. A great design team is there to brilliantly implement the new site, features and brand you tell them to build. While they can give you some guidance on a few areas, the responsibility is 100% in your hand. The most crucial work in the entire process happens before you ever even speak with a designer. It’s easy to brush this part off. But if you do, you’ll likely end up with a beautiful, expensive site that doesn’t improve your bottom line. Every store owner needs to have a “To Improve” list for their site that is added to on a regular basis as problems occur. If you don’t have one, start one today. You may think you’ll remember all the problems and UX (user experience) issues that pop up over the months and years from random customer emails, but trust me – you’ll forget 90% of them. If you do have a list like this, it’s a great foundation for your pre-design prep work – and one I relied on heavily for creating the ultimate design brief. It’s hard to over-emphasize the importance of watching actual people use your website. Despite being in business for 6+ years, we discovered some massive friction points and terrible UX problems that we’d never known about. These are issues that we’re addressing head-on with the new design. We used UserTesting.com for our UX testing, which lets you remotely watch someone complete a task on your website for approximately $50. They even let you set specific demographic details testers have to meet. In our case, we asked for males between the ages of 30 and 60 years old who owned a pickup truck or 4×4 – the exact demographic we were optimizing for. Make sure you’re applying the 80/20 rule to your redesign efforts. Use Google Analytics and your reporting tools to find your top landing pages and your best-selling products. We went through and tagged our top selling products so we could prioritize writing top-grade copy for those. We also realized that many of our top landing pages were mediocre articles with no call to action … yet they were driving an enormous amount of our traffic. Getting those spruced up should have an abnormally sized impact once we relaunch. Hopefully you already have a site structure that’s optimized based on keyword research. If not, there’s no better time than the pre-design phase to do it. Creating a site structure to maximize your organic traffic is beyond the scope of this post, but I’ve created this in-depth site structure training exclusively for private forum members. Fortunately, we’ve already invested the time to optimize our site structure and will be using much of it for the new design. Spend time browsing through your site looking for pages and content that is old, outdated or just needs to be improved. Personally, I find the redesign process the ideal time for general website housekeeping and updates. We found lots of things – from product pages to tech articles -that were in desperate need of an overhaul. I spent an entire week doing nothing but rewriting articles in our CB radio learning center. Not the most glamorous or exciting week I’ve ever spent, but it should pay off in spades once we go live. Homepage Qualaroo Survey: This survey was triggered when customers began to exit the site, and asked “Is anything holding you back from purchasing today?” The goal, as you can likely gather, is to try to determine why people left without buying. Post-Purchase Survey: On the other side of the spectrum, we want to know what selling points really resonate with customers – and make sure we emphasize those in the new design. So we ran a simple survey on the confirmation page asking them the following four questions. It also served to help us discover friction points customers encountered during the process. Tell us about yourself. We’d love to know more about you. What hesitations did you have about purchasing? I believe I borrowed these questions from Avinash Kaushik, but I’m not sure. Regardless, they resulted in a lot of good data. Once you’ve collected all this data, it’s time to turn the insights into tangible design implementations. I’d recommend doing this all in the master design brief, which you can use both as the organizational center of your redesign process as well as something you can show to designers when the time comes to get quotes. My design brief ended up being very involved at 14 dense pages and included just about everything you’d need to know. The more detailed you can be, the better. You should be writing about specific features, page layouts, navigation structure, checkout flow, etc. Pretty much anything that you determined is important for the new site needs to be detailed in your spec. You also want to make sure to share your thought process behind “softer” issues like color and feel, customer demographic, redesign reasons, etc., so that your designer has some context for both your business and the goals you’re trying to accomplish. In my experience, from-the-ground-up site redesigns are simply too involved to try to justify every decision with data. In a perfect world, you’d find potential friction points via your data gathering process and A/B split test a potential solution to make sure it did, in fact, lead to more sales/a better customer experience. But sadly, we don’t live in a perfect world. Especially if you’re an independent merchant with limited resources, trying to back up every design decision with A/B test data will not only take you years, it will drive you MAD. So I’m going to offer some advice that goes against what you’ll usually hear: test the really big things if possible, and then make changes based on common sense and the anecdotal evidence you see in your UX testing. Will you get some things wrong? Sure. But if you’re genuinely incorporating the feedback from your customers’ UX testing and surveys into your design, you’ll have to screw up big time to have all of those changes decrease conversion across the board. Initially, I hadn’t considered going through a detailed wire framing process. I was planning on simply handing off my beast of a project spec to my designer and hashing out revisions once version 1.0 of the site was finished. Thankfully, Carson convinced me to invest heavily in the wireframing process upfront. First, you make sure you and the designer are on the same page visually before you invest heavily in the design process. Making big changes in the wireframe stage is trivial. Trying to re-work things after you’ve spent lots of time on design and coding work is much more painful. Second, you create a detailed blueprint for your site that can be handed off to any competent designer. Since Carson had a lot of experience with the process, I hired him on an hourly basis to help me build a detailed wireframe and sitemap. But you can also use a site like Basalmiq to create your own wireframes. Compared to projects where I did no wireframing, it’s amazing how helpful it was for fleshing out ideas, identifying problems and being able to think through things visually. Below are the home and category page wireframes we created to give you a sense of the level of detail we went into. The complete 17-page wireframe is available to all private forum members. Up through the wireframing stage, we’d hired Carson as a consultant to help with the wireframing and paid him on an hourly basis. Because creating a site blueprint is an ambiguous task and hard to forecast in terms of time required, it made sense to have an hourly arrangement. Once we had a wireframe and detailed project spec that we both felt comfortable with, Carson gave me a firm project quote using those two resources. The quote came in right around $30,000, which was a little higher than I expected – but close enough that I felt comfortable moving ahead. You might think signing a contract with a designer is the first step to a successful redesign. But if that’s how you approach your project, you’re bound to have problems. … and all of this was done before a single line of code was written. It’s a surprisingly large amount of prep work. But it’s absolutely essential if you want your project to be a success. This is the first post in what I plan to be a three part series. In the next post, I’ll be diving into the nuts and bolts of redesigning and migrating a store, and how not to botch your migration. How do you coordinate a half a dozen people with interdependent projects? What do you need to consider when moving from Magento to Shopify? And how do you ensure your organic traffic doesn’t tank after the move? My third and final post will reveal the new redesign, compare and contrast it with the old site and – most excitingly – share the early results in terms of changes to conversion and revenue. In short, we’ll find out if my $50,000 bet paid off or if I’ll be moving back in with the parents after crippling my primary source of income. Photo credits: Photos by CayUSA and Scragz. Exciting. Would be great to fast forward 12 months and see how it turns out. Shopify I think is the right choice. I like how down the track you can easily flip the site to someone running a physical store or warehouse direct to public with their POS addons. You can fudge this with BigCommerce but no where near as nice. I don’t know why anyone would use Magento these days. I’d sure love to see 12 months into the future as well! Few things are as exciting as flipping the switch on a 100% new redesign to see what happens. Hopefully we’ll get a good sense after the first 2-4 weeks when we launch in January. Great article and as usual I love your candidness. In my experience, redesigns have rarely failed to move the needle to any real direction for us but I’ve never invested anywhere close to the amount of money you have. The real benefit I’ve found is the forced ‘house keeping’ bit. In the past were the revenue growths you seen more due to increased revenue growth or increased organic rankings? Can’t wait to see how things turn out. Thanks Bryant! Over the last few years, the revenue growth we saw was due to successful redesigns and to a lesser degree email marketing and increased order size – so organic traffic didn’t grow much. I know the 50% sounds high, but I think it’s realistic. There are a LOT of UX improvements this makes – if it was just a visual thing, I’d agree. But much of the friction of the purchase is being removed. But time will tell, we’ll all find out soon enough. Been a long time reader and would like to just say thanks for all of the valuable information. We are planning on building 2 new stores in 2015 and this information will come in very handy. Thanks Anthony! Let me know how those redesigns end up for you…. This is a great post Andrew. Having moved through major redesigns I know how much of a tightrope-walking act it can be. I think having REALLY done your home work, you should be in good position. This checklist is a great guide for anyone thinking of a redesign. Most importantly, you’ve kept your customer’s needs at the forefront. I also think your point about not justifying every decision with data makes sense in a lot of scenarios, although it flies in the face of conventional wisdom. A data-driven and iterative series of improvements is obviously preferable, but some times you are tied to an out-dated framework and simply can’t move forward on an iterative basis. Other times it’ll just take too long to migrate one small change at a time and you need to take a leap. I have my fingers crossed for you; look forward to seeing the results. Yeah, the issue with data vs. no data is a hard one. Perhaps I should rephrase it to say “Don’t feel you have to back up everything strictly with A/B test results data”, because almost our entire redesign is based around anecdotal data from UX testing, surveys, etc. The one thing people don’t realize about A/B testing is that it takes a lot longer than people think, and when doing a replatform + redesign, you have so many decisions to make that – especially as a small team – you’d be paralyzed if you needed to test everything. Thanks for the well wishes and for reading! Yep good point. I too was using “data” in the sense of statistically significant A/B test results. We’ve spent 4 months researching a new platform for eluxurysupply.com and have also decided on Shopify. The current site performs very well but we are ultra limited using a third party hosted ASP.net site. Like you, mobile and responsive design weighed heavily in our decision. Here’s to two successful relaunches. Wow, Andrew, every point in this post could almost exactly cover our similar redesign of Municibid that is set to launch the week between Christmas and the New Year. It’s been in the works for about 6 months, which was our realistic timeline (although I was hoping for 2 to 3 months). The cost is also almost the same as yours at about $50k. We are expecting similar results with conversions. We have a number of small tweaks that should make a significant, positive impact. We also went with a responsive design, as opposed to a fully optimized mobile experience for the same reasons you outline. I love the way you put that your customers were buying despite your website instead of because of it… we felt the same way. I can’t wait to hear/see how the upgrade works out for you. Best of luck! Hey Greg! Good to hear from you, and it’s uncanny what similar boats we’re in in terms of timing, budget, etc. If you’re willing, would love to hear how things go when the redesign goes live. Let me know and/or share in the private forum? Thanks for reading and best of luck when you flip the switch! I’m not quite sure I’m braver or work harder than you. 🙂 That week is a historically very slow week for us and allowed us to easily ask our selling agencies to not end auctions during that time. It’s really the best time of the year or us to flip the switch. It also gives us a hard deadline to get it done. The whole project is one of the biggest I’ve been a part of. I’ve learned a lot about the design and development process. I made sure we had a truly professional and highly experienced designer and development team… it’s so worth the extra money. From an ROI standpoint, the upgrade of our core software from a combination of Classic ASP and ASP.NET to fully ASP.NET will allow us to have access to a larger pool of developers, which will drive down future development costs. It will also allow us to save development time by not having to spend extra time rigging things to work with Classic ASP. I’m really excited to see the results and will for sure share them in the private forum. Great, thanks! Will be very excited to hear how it turns out for you! In terms of project size, redesigns are definitely some of the largest – if not THE largest – types I’ve been a part of as well. I know you don’t want to, and recommend not to, test. Yet I still wonder if you could have implemented and launched your website re-design in parts. 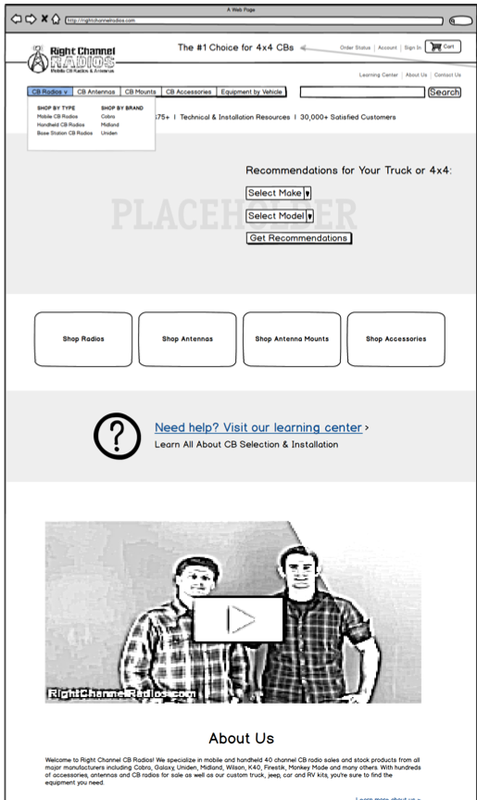 Say the home page with the learning centre. Also the category pages seem to be a good bet as a test. Your visitors and clients would still have a better UX compared to your current set up. And you could assess your assumptions (or Hypothesis sin lean start up parlance) before spending the entire 30K. Clealry this approach woudl slow down the overall development time. Yet your clients and visitors would have a partly better experience much earlier and you would have validation or see issues before the whole boat leaves the port….then it would be too late/expensive to repair a sinking ship (my father had a large ship;)). Good points, Blasko. That would probably be the most scientific and safest way forward! But two reasons we opted against it were 1) the timing / opportunity cost of a long, drawn out implementation and 2) the fact that we’re replatforming at the same time as the redesign. If we were staying on Magento, it’d be pretty easy to roll changes out in stages. But with moving to an entirely new platform, that’s not an option because we have to build something into the new framework as we’re starting with a blank canvas. But again, very solid points and I think you could easily make the case it’s a safer way forward. Thanks for the comment! Hello Andrew, Thanks for your post and all the articles I have been getting from you. Pls what advice do you have someone like me living in Nigeria and wants to go into commerce full time but lack the necessary knowledge and experience on what to niche to sell online or dropship. Please I need to know more as I want to start next year. Hi Luis – I’d recommend checking out my free eBook and the resources here on the blog. Lots of articles to help you get started. Good luck! Hello Luis, it is not rocket science, you just have to learn basics of internet business intelligence. What’s your mail address will send you some helpful books. Just launched http://www.cokodeal.com call on +2348163152939. Cheers. Wow, Andrew, you are a MUCH bigger risk taker than I’ll ever be. 50% is a very optimistic goal for a well-seasoned site; I hope you are right! I agree that in the case of your website, Shopify is a good fit. I use BigCommerce, myself, for my sites simply because it is better with product variations (variants, options, whatever the shopping cart calls them). My stores always have products where there are multiple versions of it to choose from (size, color, material, etc) and Shopify simply does not do product variations well when there are a ton of them. Shopify works perfectly for the products you are selling, though! I think it is very wise to go with a hosted solution and both BigCommerce and Shopify have responsive design templates that handle the mobile version of the site for you. I’m seeing 20-25% of my sales coming through mobile devices now, so you are right in moving platforms if Magento is not up to the task. I also believe both shopping carts host the majority of the load-intensive files (like images) on cloud services, so I don’t think there will be much of a drag on page load times at all. I wish you every bit of luck and success and thanks, as always, for the interesting read. Sounds like BC is a perfect fit for you, as I know they do handle complex product variations really well. And 25% of your sales through mobile? Wow, that’s impressive! I’d love to be at that level post-redesign. I’ll keep my fingers crossed…. Thanks for the comment, and for reading! Thanks for sharing Andrew! I follow your thinking and definitely think investing in a proven business where you are addressing known issues and trends makes sense. I do question your 50% improvement though. I understand that is what you saw last time, but I’m not sure you’ll see it again. But honestly even half of that still makes this worthwhile. Could you clarify one point for me concerning the reason for the re-design. Do you actually *know* that the reason for the fall off in sales is due to the increased number of mobile visitors ? In the post you say that the mob/desktop visitor split has changed . Logic suggests there might therefore be a corresponding change in the split between buyers too, a simple follow on if you will. Do you have specific evidence to suggest that it’s the lack of a responsive design which has caused this reduction in sales or is it just a gut instinct ? Did the UI testing prove your case ? As a newbie feeling his way – am really getting a lot from this site so thanks for that. Best of luck with the upgrade. Over the last few years, we’ve seen our desktop conversion rates stay fairly consistent (down a bit, but not too much) while our conversion rates on our mobile site were pretty abysmal, but while traffic and revenues were still increasing via that channel. Glad you’re enjoying the site and thanks for reading! Very welcome, Michael – glad I’ve been able to help! Excellent article. You mention ‘I’ve made no secret about this the last year: eCommerce is getting more competitive’, was this in a previous article? If so do you have a link? Really interesting post Andrew. Having just completed a redesign for Rustic Artistry, I realize that I should have created more specific documents for what I wanted changed, like you did. Without them the designer has to do a lot of extra work because you haven’t thoroughly thought through (thththth!) exactly what your needs are beyond, “make it look and work better” in general. Careful planning up front will save you and your designer a lot of time and frustration as the project continues. Looking forward to reading the updates. Thanks Carole! And a really nice job on the redesign over at RusticArtistry.com! Just checked it out and it looks fantastic. You guys obviously put a lot of work into it. Hey Andrew, best of luck! A site redesign + a replatform is a huge move for an established website so it’s wise on your part to get someone who knows what they are doing. And for the part about investing all of that money? Betting on yourself is the best investment you can make. Congrats on the redesign! I agree with 95% of your approach except for outsourcing the final design & implementation. You came up with a 16 page document specifically laying out your plans for the site — this is a designer’s dream and greatly improves your changes of success! I’m sure with your years of experience in ecommerce and specifically with radios you have a very good idea of who your customer is and what they are looking for. Which begs the question, If you (the company) owns all this unique information about the market and customers why did you hire someone outside of your information bubble for one of the biggest opportunities in your company? Why wouldn’t you hire a Jr. designer or someone abroad to join your team at year at 30k/ year to execute on your vision and continue to build/ own expertise which will invariably be valuable in the future. It’s mobile this year and will be something else in the next 6 months we need to optimize for. This process is ongoing and you hypothesize it took you too long to get to this redesign done. I know for myself things like this get put to the back burner because of resources and the ROI isn’t always immediately clear. You figured out a formula for your ROI but if I understand it correctly you will have to make a similar investment in the future to increase your income. My general rule of thumb is I contract out for anything that is a repeatable process or something that is out of my wheelhouse. I would argue that your design sensibilities for this site are better than anyone you could hire. Seems to me that you may be better off in the long term brining in someone that can tackle light dev and design work for all your sites. IMO investing 30k into a contractor that punches in and out has less long term value for your company than a team member, especially in your case where you are highly capable of managing and directing with a strong vision. 1) One of the underlying goals in moving to a hosted platform was to cut down on site maintenance. And while you’re right – today it’s mobile, tomorrow it will be something else that needs to be tweaked – being on a platform like Shopify that manages and pushes core functionality updates should hopefully help with that. So we’ll need to update at points I’m sure, but the amount should “hopefully” be less going forward, especially from a core functionality approach. 2) I know you can find outstanding devs all around the world, but I really wanted one for this project that was in my time zone and that spoke English natively given the level of collaboration and the back and forth we have. I probably hop on the phone with Carson on a moment’s notice to talk through a complex issue 4-5 times a week – if not more – and trying to do that with a dev outside of NA would have been trickier. And in terms of budget, wasn’t in a position where I wanted to bring on a $100K+ North American developer on staff. 3) Launch Timetable. I really wanted to get this launch executed both a) professionally and b) quickly, in time for our busier Spring season. You know what they say: fast, good, cheap – pick two. So I wanted someone with a proven track record, a high degree of expertise in Shopify rollouts, and also that had existing designer relationships they could leverage. I might have been able to do this affordably by hiring a talented/hard working/responsible Jr. dev, but those hires can often take time to find and uncover with lots of trial and error. I wanted to work with someone immediately who I knew could hit the ground running. 4) Finally, to be frank, I really wasn’t interested in bringing on another team member to manage. To manage anyone well takes time / work, and unless it was core to the success of the business (which I’m not convinced it is), I didn’t want to add that ongoing workload to my plate if we could help it. If this were a SAAS app where code is the primary value add, I’d absolutely have someone on staff. But on a hosted platform where I can see us only making big changes every 2-3 years or so, to me the benefits of hiring someone who just gets it, can execute quickly and doesn’t need to be managed outweighed the other considerations. Sometime in the future I want to be facing the issues with your launch. I am new to ecommerce and learning as much as I can. I really like all the information you have provided so far. Can’t wait to see how it turns out! Lotta cash but you get what you pay for. Question though – What do you think about operating multiple sites in the same general niche, but targeting different market segments? For example, one store operating as a “premium” store with free shipping, long return periods, no restock fees and other customer centric features, with another site operating as a low price store with shipping charges, short return periods, restock fees, etc. We’re already operating a premium store and are thinking about launching another site to target consumers just looking for that lowest price. Hey Charles! I think that approach – one premium and one discount channel – can work really, really well. Allows you to capture the full value from all of your customers without losing sales. The only downside is that from a SEO and branding perspective, you do give up the power of having everthing wrapped up into one nice brand. With SEO, you split up your domain authority and may not be able to rank quite as well. From a branding perspective, it’s another name/brand you have to grow and build up. But if you can swing it, I think it’s definitely a viable channel. Most of the major car companies do this. A Lexus is simply a dressed up Toyota with a higher-end marketing campaign and finishes. Is it a better / more expensive car to make? I’m sure. But I would also imagine the margins on the Lexus are much better than on a Camry. Hi Andrew – a great thread and thanks so much for sharing all the data. I am very pleased and grateful to you that I read it. I was thinking of re-designing our site to re-launch it. It started out as a holding site as we needed a site to prove credibility to our wholesale customers. Now it is full scale e-commerce, or at least that is the plan, and thankfully one of our forum members Katrina Mckinnon, who is amazing, said don’t waste the money just tweak what you have. Having read post as well it makes sense, we are at the beginning, we do not yet have a profitable to site worth that type of investment. I think that you are doing the right thing, risk is always part of growing your business and it seems a very calculated play. I have built an e-commerce site for double what you are spending (not time just cash) in a former business and I wish I had simply trialled it in a hosted environment, much cheaper and much easier. It did not work and we had to re-write it, a very painful lesson. But one of the things I learned is that I did write all of the wireframes and logic around them, however I also fell into the category of being too clever and carrying on writing once the project started which caused headaches for everyone. I tried to make it better and better as it evolved, it took two years! I was running a bug list of at least 100 items at a time post launch, not fun for anyone. So my only point for you is once it is signed off don’t starting getting cute and thinking of other ideas as you read about the latest e-commerce play. Changing a wireframe when the project has started may seem a good idea but its knock on effect may be immense, you will miss something. Lastly, I use shopify and it seems to get better every day. I know that it is easy to customise. Your budget of $30-50k is right in the sweet spot also for e-commerce specific businesses, our is fashion and there are few around in US, UK and Australia who specialise in these. Not the big players ie shopify, volusion, bigcommerce. Are there are any specific or relevant to you outside of the big boys that you investigated and if so why did you not go with them? Hey Ed! Thanks for the comment! Good advice on sticking to the plan. I’ve been “pretty good” so far, but have mad a few tweaks and additions that I couldn’t help as things came to me. For my own sake (and Carson’s) I’ll try to better stick to the original plan. Interesting to hear you experience with custom coding, thanks for sharing. Those kind of stories are what made me want to move toward a hosted solution. Nothing is worse than spending time/energy on platform bugs when you simply want to get back to running / marketing / growing your business. My decision came down to Bigcommerce and Shopify, so didn’t do any deep dives on any other platforms – so can’t comment on that. Again, thanks for the comment and so glad to have you in the private forum! hey andrew – great stuff in here. I believe that you guys are doing the right things for your particular business model and company situation. when you have been doing the same thing for a long time, you have to carefully consider wholesale changes to the ecosystem. I also wanted to throw out there that anyone who hasn’t been in business for 7 years should really look at upgrading a lot faster and cheaper than what you’re doing here. we manage some e-commerce sites for clients who do white label products that we develop, and we iterate and change things in shopify all the time. they have responsive sites for $140-$180 and you can hire a designer off E-lance or 99 designs to create all the content that you need to populate these shipify themes. shopify has free coding and 24 hour support that is pretty helpful in general. they also have people that can jam out easy stuff for not too much money like changing your graphics. Thanks for the comment Chris, great points. Definitely agree that newer / young businesses should be much more budget minded. In many situations, a good premium theme and a nice custom logo will do the trick. Out of pocket? Less than $1,000. Appreciate your reading and for weighing in here, thanks! Nice post Andrew. As you know we went through a similar process at Empire Flippers in 2014. While we covered a lot in our posts (and even had one from the designer himself), I like you approach here, it’s really a roadmap for people looking to do something similar. Thanks Joe! Loved how your redesign came out, and definitely tried to learn from your guys’ approach in tackling this project. I’m jealous you’re now on the post-launch side of things, but we’ll be there soon enough. Andrew, I have to say I am a bit dumbfounded by your decision to drop 50K on a website redesign. 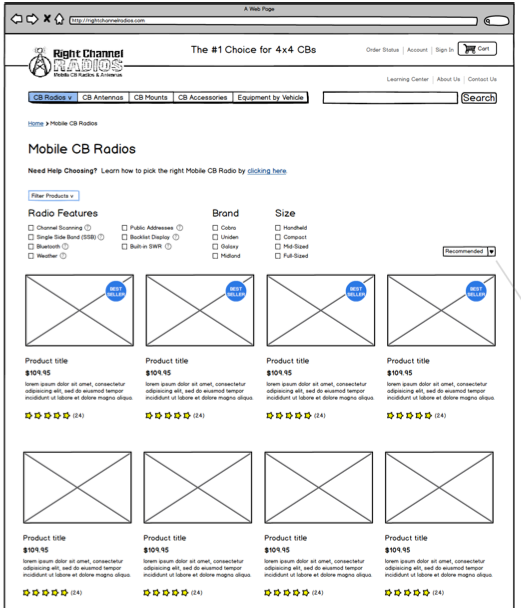 I do not see anything that is unique to your wireframe design, as it looks like so many other e-com sites. What I see from your wireframe is a fairly basic template that you could snap up for $100. So where are you spending the other $49,900.00? I can see your doing some specific sorting of product features – this is an off the shelf script or one that needs mods. So I’ll give you $1,500 for the sort mod. We are down to $48,400.00. I could go on and on…. but having been in ecommerce and internet businesses since 1998 all I can say is your wasting your money. Add a nice new template and see what happens. With the rest of the money buy your wife Annie something she always wanted, go on a vacation, pay off the house, or put the money into a new business or invest for your retirement. I have done what you have proposed and regretted it after doing it, this this with a grain of salt but I think your pouring your money down the drain. I wasn’t as clear as I could have been, but the wireframes really were VERY basic outlines that served to help us think through functionality. The design looks much more polished. More importantly, there’s a lot of custom functionality you aren’t seeing. You saw just a tiny fraction of the wireframes, and not any of the design spec that details all the custom features. I don’t want to spoil everything for the redesign and give away all of our new features, but one custom thing we’re implementing is “Get it by X Date” in the cart / checkout process. There aren’t any apps for this, so we had to develop it from scratch. This is just one of many customizations we’re doing. From a mobile perspective, yes, you can buy responsive themes. But with the customization we were doing – and also wanting to make sure we’re really making it flow well (lazy loading, proper image re-sizing / compression, etc) I wanted someone who really knew their stuff to implement this well. Like I mentioned in the post, we’re investing heavily into the copywriting and pictures for products. So that $30,000 is dev/design work, but $20,000 is internal staff work. Yes, it’s a real cost but still one I would have to incur anyway from my team on payroll. I’m just choosing to allocate it to this project. So could you argue at this point it was an aggressive investment and money could be more optimally spent elsewhere? Or a redesign done more cheaply? Perhaps. But it’s impossible for you to say I’m pouring money down the drain until we see what impact it has on sales / business value. You could be right, but we won’t know until I release the results in a few months. Thanks for such a thoughtful rebuttal. I have been a long time listener of your podcast and you prompted me to create a couple more stores, so I have to say thank you to you for that. I know your on magento for this site, but you have also spoken in the past of moving to Shopify. Everyone has there choice of platforms, and for me I hate Magento, because when it crashes it crashes hard. The idea of a 3P platform is one that I thought about long and hard Shopify, Big Commerce and 3D Cart. Personally I like 3D cart if I wanted a hosted 3P platform. We opted for WP Woo Commerce – with 20K products on one site alone its fast. We drop ship like you and have automated the process so much technically we don’t ever need to look at the orders as we have everything from customer order, payment, vendor PO’s, 3P shipping etc. And it has never let us down. Sure there was a lot of tweaking and learning but we dropped $500 for a little custom programming, and used plugins for the rest of it with some SAS integrations. Now if we take your staff cost out of the equation we are left with $30,000 in development. 30K is still a lot of dev $$$ in 2014, back in 2000 I think I would have played a different tune. iii) have minimal fresh coding done. I would bet you that taking this approach will save you $15,000 at least! Bells and whistles are cool and we do it because we think it will provide a better customer experience, but I think we do it for ego. Some time ago you spoke of doing a lot of videos. And on the Cobra 75 http://www.rightchannelradios.com/jk-jeep-cb-kit.html you did a great job. I would hazard a guess your conversions on this page with the addition of videos has increased 22-37%…. am I right? When I look at your site It looks crowded, I think it needs a bit of breathing room. What if you were first to try a new template, its a weekend project and your cost is less than $100. The reason for this template is that it is responsive, clean, and has high customer/webmaster rating. Mind you I only spent about 15 mins looking for a theme. I believe that by just changing the there to a template – out of the box no mods you will take your site from where it is today looking a little old and dusty to a bright shinny new MACO paint job. Do you really have anything to loose by spending $100 and getting responsive today, and a site that is a little fresher and more modern? Sure the new template may detract customers or you could see a 20% boost in conversion. I think a $100 test is on the table. Are you willing to take the $100 Challenge? If a design change sees an improvement in conversion then you should look at a custom template, if the $100 test does not work then we all know that a pretty new design is not the problem. The one thing that I will add as I have tried to apply my methods to my OWN site, is that even for the most bootstrapping-est of business owners (or gee, someone who does this for a living), it can be hard to do this work on your OWN company. Fortunately, there are contractors who can help you with the entire content strategy. Your involvement is key, but no one has to do this on their own and a content strategist can walk you through each step. I’ve found that what my clients say they appreciate most, beyond a solid strategy and all that goes with it, is someone far enough removed who can step back enough from both the business and its customers to truly see that sweet spot where they intersect. Owners are often so close to both customers and business, that they can’t take the long, uncomplicated view and see where they can best connect with their customers. I’m also with Andrew on passing on A/B testing and agonizing over every little data point. Still, data has its place. It helps tell hard truths that sometimes business owners struggle to accept. I had one company who was so proud of their technology, they wanted to make it the centerpiece of their messaging, even though it really wasn’t the right differentiator for them. Fortunately the data played out—only 3% of site visitors even visited their tech page, which helped us 1) tell that tech story differently and 2) convince the client to move onto a more stable brand platform. Excellent, excellent post Andrew. May your readers make many positive changes with this one! And great points you make, 100% agree with you on both. You’re right, it’s pretty amazing how blinded owners can get from standing about 1/2″ away from the business (no perspective). And I’m all for using data to backup the bigger elements of a redesign or strategy. I think it’s just when people want to test 57 different things before the agree to make changes that progress slows to the speed of molasses. Good seeing you downtown yesterday, hopefully we can catch up soon! Hey thanks. 🙂 Yeah, took a minute. Thanks for such a candid post! I’m particularly interested in how the change to more humorous, less dry content goes. Hopefully you’ll have a way to read if that was a worthwhile investment. Yeah, I’m very curious too. We may have to roll back the copy to the pre-launch *yawn* stuff on a few products and A/B test it to see what kind of lift it produces. I’d be very curious to know as well. As long as your humorous copy is still clear and doesn’t gum up the visitor on getting where you’re going, I’m 1000% sure it’ll make a change for the better. In my 8 years of professional copywriting (extend pinky finger) I’ve found people connect to a more human, personal voice, as long as it’s short (and as long as that particular voice resonates with that particular audience). And I mean hack your stuff in half short. Excited to see it! Thanks Stoops! I hope you’re right. Great blog post! I have listened to all of your podcasts and really enjoy them as well. I like how open and honest you are about the many aspects of your business and even your personal life. I need to get around to joining your private forum, I am sure it is very good too. I am excited to see your progress on your redesign. We too are in desperate need to perform another redesign and cleanup. We have migrated many times to new platforms (5 times) and performed many site redesigns (lost count). The first few times, I was nervous as heck. I am no longer nervous but we are by no means perfect at it. 🙂 We have carried over some “baggage” over time that really needs cleaned up. Our redesign is a high priority for us as well and I plan to watch you closely. Best of luck! I am pulling for you on this one. Thanks Chris! Appreciate you reading and listening! That’s an impressive redesign track record you’ve got. The first one sure is terrifying, isn’t it? You flip that DNS settings switch to go live and have no idea what’s going to happen. But usually, as long as you’re careful, you can do it without too much chaos. Really love your posts. I don’t think anyone else’s blog deals with ecommerce project as good as yours. Looking forward to the next ones already. Thanks Amarjit! Greatly appreciated, and thanks for listening / reading. I really enjoyed reading about how you approached this project, Andrew. We’re in a similar situation. We started with a custom design then scrapped it for a stock theme. Now we’re ready to revisit a custom theme with the knowledge of what works for us and our customers. I added a few notes from your process to our plans and will check out the briefs and wireframes. Thanks Fred! Sounds like we’ve taken pretty similar paths. Hope the resources are helpful, and that business is great at Tortuga. It’s a big bet, yes, but you’ve done the math and I think a 50% boost in sales isn’t unrealistic. I am looking forward to hear more about it. 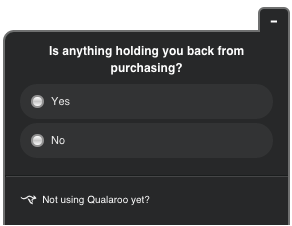 I’d love to hear a bit more about the Qualaroo and post purchase surveys you ran before the redesign. I think asking customers for their opinion is possibly the most important part of the process and yet so often overlooked. I’d say as long as you got some solid data to back up the redesign, A/B testing won’t be a crucial need, so I can see why you’d forget about it :). Happy to share a bit more about the surveys. Was there something specific you were hoping to learn / hear more about? About the survey I just had a question about the Qualaroo survey. I suppose you didn’t stop to a yes/no question. What did you ask afterwards? Also, only if you don’t mind sharing, I’m curious about the response rate for this kind of survey. I imagine the post-purchase landing page got more replies than the Qualaroo. I would love to implement something like that on our site. We’re not ecommerce but an SaaS solution and I think getting feedback in general is an excellent way to improve the web page design and copy. Hey Andrew! Please don’t blame me for commenting on this blog page. The fact is I forgot (or maybe just don’t know) how to post suggestions other than in the comments. I’m doing my website with WordPress (because it’s darn cheap) and I wonder if you could make (or made) a tutorial on that. I know, there are plenty of tutorials out there on this matter but they all use an eCommerce plugin to it (”WooCommerce” (sry for the spam) seems to be dominating…) Also, is it a good idea to be programming html and css or is it pretty irrelevant to the business? Ahhh the beauty of a well designed webpage! I’m just trying to figure out if it’s really worth my time (how long does it take?) (so to help me skip and save money on the plugin and extensions) or should I just open the website to the public already. Great blog post with lots of useful insights. I was curious if you started with a pre-existing Shopify template with plans to customize or if Carson is building a template from scratch based on the wireframes and design plan you provided? Also, did you and Carson run into any system limitations in transitioning to a hosted cart or were you able to incorporate all UX requirements and improvements into the new site? Thanks Josh! Carson started with a very minimal Shopify template that he knows well, and likes because it’s pretty clutter free and lets them go a lot of directions while providing a great foundation. Can’t remember the name, or I’d mention it here. Hey Josh, the short answer to the question you’re probably asking is – yes, we built it “from scratch” based on the wireframes we produced with Andrew. This is a great description of the (often painful) site redesign process. It’s nice to see someone point out the value of a $50K redesign project, which is probably a shocking price for some people. You get what you pay for. There is a huge spectrum of talent in web design and development. I’ve helped clients who have paid have paid a self-labeled “web developer” $5-$10 thousand for a site and end up with something so bad that I end up starting from scratch. As a developer, I’ve been involved in e-commerce projects with prices close to $200K and for those companies it was a great investment. I think you’ll have good luck with the switch to Shopify. The Liquid template language is very powerful, I’ve seen some really great Shopify sites. Thanks Derek! Yeah, the price tag is shocking to many but it ultimately depends on if you’re striving to make meaningful changes to help the business make more money, and the quality of the people you hire. Hopefully it will work out well. Have already been impressed with Shopify’s Liquid template, it was definitely one of the reasons we went with their platform. Thanks again for reading and your comment! I think one huge advantage you didn’t mention with a hosted cart, PCI compliance and data security. Come October 2015, data breaches and their associated costs can be pushed back onto the retailer if they are found deficient in their PCI compliance and Data Security Standards. Just slapping an SSL certificate on your site does not make it PCI complaint unfortunately. I cringe every time someone tells me they are doing an e-commerce site in wordpress and woo commerce given the well known security issues in wordpress and woo themes own data breach in 2014. Unless you are checking for daily updates and being very careful in what plugins you are using, you are opening yourself up to liability, a big one. Remember, in 47 states, DC, Guam and the Virgin Islands, you are required to notify affected customers of a breach of their personally identifiable information. Some of them says it has to be by letter (not just email). There is a reason 60% of business with a data breach go out of business in 6 months. That being said, Shopify, BigCommerce, 3dCart, Americommerce and even Cart 66 (if you must use wordpress, use this cart instead) have gone through extensive PCI audits which even lowers your PCI Complaince questionnaire. I like Shopify and think it fits well on both tails of the e-commerce curve, simple niche related shops and more advanced shops that need the customization you are looking for. In other cases, still like BigCommerce and playing more with both Americommerce and 3DCart. I started listening to your podcast last year and just came to the website on a whim as I’m getting ready to do a full redesign of my ecommerce site. I’m SO glad I read this post, I feel like I need to back the bus up and do the 3-4 months of UX testing and customer surveys while looking for a potential designer instead of jumping straight to hiring a designer! My budget won’t be quite as high as yours, but it’ll be by far the most I’ve spent on any single project related to the business. Having had a blog redesign go poorly in the past, I’m also anxious about spending 3x-4x the amount for my ecommerce site. By the way, I love the eCommerceFuel site design. My site is more like this one, community-based, then a seller of physical goods. Did you also write a post about the redesign of this site? Actually it would be “nearly 5x”, you should deduct the investment from the return.